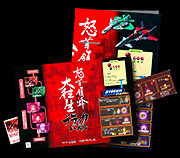 Shortly after the arcade release of dodonpachi Dai-Ou-Jou, CAVE released dodonpachi Dai-Ou-Jou Black Label (which also contains the original version of Dai-Ou-Jou. You select which version to play as it boots up). It was purportedly released due to a small number of complaints from high-level arcade players regarding the original version of Dai-Ou-Jou. The most common complaint was that Dai-Ou-Jou confiscated any spare lives you had at the end of the first loop, thus forcing you to begin the more difficult second loop starting with 1 life only. In dodonpachi Dai-Ou-Jou Black Label, any extra lives you have by the end of the first loop will be carried over to the second loop. Another complaint was that while you can credit-feed through the second loop if you reach it, the game automatically ends once you lose your last life on stage 2-5. After clearing stage 2-5, you fight the secret boss Hibachi, who is one of the most difficult bosses to feature in a shmup. So this made practicing patterns on Hibachi very difficult as it would mean reaching 2-5 with a decent number of lives in stock. Apparently only 5 players were known to have beat Hibachi 12 months after Dai-Ou-Jou's arcade release - so this may have been a key complaint. For Dodonpachi Dai-Ou-Jou Black Label, you select 1 Loop Mode or 2 Loop Mode at the beginning, after selecting your ship. 2 Loop Mode is the normal arcade play with both loops (and as with the original Dai-Ou-Jou, after clearing the 1-5 boss, you have the option to continue into the second loop, or call it a day). With 1 Loop Mode, after defeating the 1-5 boss, you reach the Hibachi fight, which you can also now credit-feed through. So this makes practicing Hibachi much more feasable than what would be needed in the original Dai-Ou-Jou. There are other small subtle changes as well. The common perception is that the Hyper Meter fills faster in Black Label, but actually there are small nuances in the original that result in the Hyper Meter not always filling as it should, which have been addressed in Black Label. Some bosses also have altered patterns in the second loop. The chain meter now has 5 digits, so it won't roll-over if it reaches 9999 hits (specifically the stage 4 boss fight). As Hyper items are generated quicker in Black Label, the increase in difficulty once activated is marginally less. Both versions of Dai-Ou-Jou have two different rank systems constantly in effect, Basic Rank (raises with no deaths and maximum bombs) and Shot-Speed Rank (raises with Hyper activation). Because spare lives are carried over into the second loop in Black Label, the Basic Rank will be higher than the normal verson of Dai-Ou-Jou. The result is that Black Label has a marginally easier first loop, and a marginally more difficult second loop, providing a more balanced game. CAVE protected the Black Label PCB with a suicide battery. See the hardware page for details. In addition the game had a low print-run (rumoured to be approximately 100 copies) and therefore became quite collectable amongst arcade hobbyists. The differences between the normal version of Dai-Ou-Jou and Dai-Ou-Jou Black Label are small and not immediately noticable. The differences are all in place to benefit high level play, particularly players who wish to attack the second loop. So many of the changes may not be of much significance to western players, ie players who cannot clear the first loop, or no-miss no-bomb many levels. But if you dig deep into Dai-Ou-Jou, and really wish to persevere with the game, Black Label offers more balance, a better learning curve, and a more accessable second loop.